When you stand at the bottom of a mountain and look up, the view can be daunting. There is so far to go, so much climbing to do. From the bottom, the mountain looks large, dangerous and foreboding. It looks difficult and it’s tempting to give up before you start. But if you’re willing to try and you stick with it, one day you will make it to the summit, where there will be another , much more appealing view. You will be able to admire the scenery. You will be able to look back with great satisfaction upon your achievements. And your feelings of trepidation will be replaced with a sense of fulfillment. There are many who look at the view from the bottom of the mountain, but too few who make it to the top. 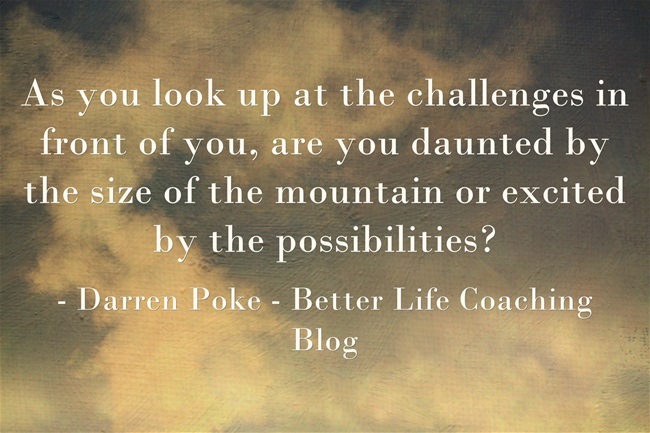 As you look up at the challenges in front of you, are you daunted by the size of the mountain or excited by the possibilities? Your answer and the action that you take as a result will determine whether or not you end up with a view from the top in the years ahead. Previous post – Because Of, Or Despite? Let the change start in you: It’s so much easier to talk about change than to live it. But in the end, it will be so much more effective if you walk you talk and be the change you hope to see in others. « Because Of, Or Despite?